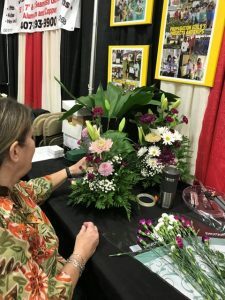 The Garden Club had a presence at the Flagler Home and Lifestyle Show January 26-27 which was held at the Flagler Palm Coast High School. Our space was in the small gym along with around 100 other vendors. Kelley Callery and Denise Garcia co-chaired the event and designed the beautiful displays. Four collages mounted on canvas which hung from the back draping highlighted the Arrangers’ Guild, Propagation Guild, Selection of the Month and Spring Festival. 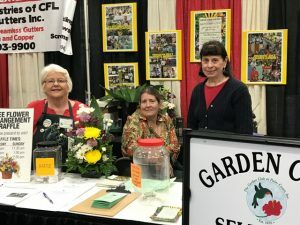 In addition to providing information on the club, the Propagation Guild had handouts on butterfly, hummingbird, deer resistant and salt tolerant plants as well as a bulletin on ideas for a low-care, low-cost landscape. 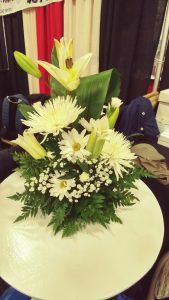 A free raffle for a beautiful floral design made by Kelley was given away every 1 ½ hours each day. You had to be present to win and many people returned to the booth to see if they won. Many of the attendees who stopped had just moved or are moving to the area and were glad to see there was a garden club to educate them on what to plant in their landscapes. 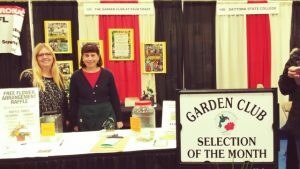 I can imagine the February meeting will have many visitors who talked to the volunteers during the Home Show. 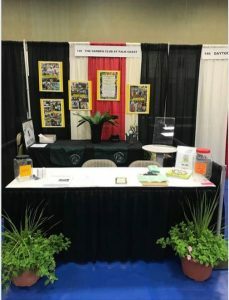 This entry was posted in Arrangers' Guild, Events, Garden Club, Propagation Guild. Bookmark the permalink. We’re so disappointed that were not able to attend this year’s event and see GCPC’s booth. Richard’s disability has limited his mobility. I’m sure that the Club had many visitors to the booth. The photos are spectacular.